Steampunk? Love it. However, that doesn't always apply to the books with those trappings. Unfortunately, The Martian Ambassador falls into this category. However, it still manages to be a decent read, and would definitely be better for a YA audience. The Martian Ambassador manages the description 'an eclectic read' in a whole new way: a steampunk detective tale - with, uh, space travel, aliens and faeries. Imagination isn't at fault here, and thankfully, we're rapidly introduced to the scope of this world - Blackwood tries out a steamy, semi-magical 'Cogitator' in the first scene! The Martians also play well - as Blackwood relates, we can quickly envisage an alternate world to Wells' in which Martian tripods are used for public transport (fun, eh?). Setting, at least immediately, works well. 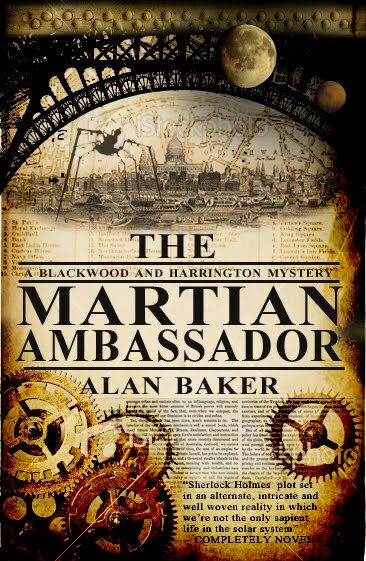 Enter the mystery - in which Thomas Blackwood and Sophia Harrington attempt to discover the truth behind the apparent murder of the Martian ambassador. And it soon becomes clear (well, when isn't there a larger scope?) that there's more at work, with an apparently mythical villain stirring up the city. So - what goes wrong? It's not the beginning, which is deftly executed. The characters, however... Aren't quite so good. Unlike (for example), the very nicely done period characters of Jonathan Strange and Mr Norrell (which I love), Sophia and Thomas' relationships just don't quite manage to cross beyond the predictable, and they fail to muster the kind of interest that John Taylor or Harry Dresden can. The story also suffers from the lack of a more sympathetic set of antagonists - and a very early escalation from mystery into chase, which quickly became tiresome. There's also a particularly silly set of twists using the faeries, which just seemed deus-ex-machina to me (as well as a tad twee). Unfortunately, that's the danger with such elements - it's very easy to stray into the predictable or cliched, and for me, this was just a step too far. Though younger readers might well enjoy it if they haven't read widely in the genre. Altogether, The Martian Ambassador is a competent read with a fantastic beginning. It's just a shame for me that the latter half didn't manage to fully exploit the better mystery elements of the first. Would I recommend it? To younger readers, yes. For YA readers new to either the steampunk subgenre or SFF as a whole, definitely - it works. However, for more experienced readers, this rarely steps out of the predictable. Comments or questions? Comment and tell me below! Wow this book sounded a bit strange at first (well, it still does a bit) -- steampunk with martians?! It's too bad that the execution didn't work out too well. I totally agree on the sympathetic antagonists point. Black-and-white works fine in books for younger audiences, but rarely in 'adult' books. (I'm sure there are exceptions, but you know, as a general rule, haha). Oh for sure! Haha I was just thinking about WoT when I was writing my comments, which was why I threw in the "there are exceptions" part haha.